give me a little time to investigate..
One thing I forgot to mention is I did the select all copy and paste of what you had wrote without noticing the "#after this you can update as usual again:" Then I just did the update line without closing the window and reopening it. I don't know if that could have messed anything up or not since it was in a different section or directory. I guess I can just start all over flash the old base image to my sd card boot it up then copy and paste it correctly? When it updates is it supposed to install kodi? Or leave Xbmc and I need to past in apt-get kodi-odroid line? lines starting with a # are comments, and terminal will just ignore them, so there's no issue with that. It will not update from xbmc to kodi. Kodi has to be installed manually. Ok I've tested the update for the U3 and came across a few issues. In fact it does upgrade from XBMC to Kodi, as I put that into setup-ogst-odroid. The issue with the missing items for the RCB is in fact the rcb_useOldAlignment value it's located in ~/.kodi/userdata/addon_data/skin.confluence/settings.xml and needs to be set to "false". After that I had no issues with Kodi anymore and everything was working as expected. I'll update the image on the first page to the recent version of this image in a little bit, therefore you don't have to do these steps yourself. But, if you can't wait, the above information should be enough to fix the image yourself. new version is uploaded and linked on the first page. Kodi working fine...i see scrappers. I have two more question. This one form sudo looks much user friendly but when i trying to update/load any core it refresh and nothing happens. And the second question at the menu there is something like mame arcade emulator, when i trying to lunch it nothing happens, form terminal i have segmentation fault. starting from terminal with sudo starts retroarch as user root (sudo = super user do -> super user = root) and with the settings for root (which are not configured by me). It's just the setting what design you want to use and can be changed in the driver settings, I'm actually thinking about changing the design to the new one soon. In the past the new design was very buggy and did not work correctly, but that was fixed some time ago. bpbiszkopt wrote: but when i trying to update/load any core it refresh and nothing happens. No surprise, the root user has no configuration for retraorch, the default config does not know where cores are located and such, don't use sudo, there's no point what so ever for useing sudo to start retroarch, it just makes your system more vulnerable to attacks. bpbiszkopt wrote: And the second question at the menu there is something like mame arcade emulator, when i trying to lunch it nothing happens, form terminal i have segmentation fault. Don't know about this, that's nothing I installed (at least it shouldn't). meveric wrote: Ok I've tested the update for the U3 and came across a few issues. I installed a xu4 fan on top of my u3 heat sink and plugged it in. Is there a way I can have it come on like you do the XU4 game station turbo build on my U3? The fan noise doesn't bother me at all. it should do that automatically when needed... the U3 is much cooler than the XU4 therefore it's rarely needed.. and stays off most of the time. I used to use this image years ago and remember it being excellent. Recently I've been trying to get this image running and for some reason whenever X starts it is an ungodly mess - it looks like huge slanting diagonal streaks, as if the rendering is trying to rending an image much too large. Weirdly, the mouse cursor is rendered on top of this and works perfectly. I believe this is because Xorg renders the mouse cursor seperately? Once XBMC starts the mouse cursor disappears (I presume because it starts rendering it with the mali drivers) but the rest of the screen is still rendered in the same broken slanting horizontal fashion. The console works fine an renders normally. I cant get a working vesa or fbdev xorg config to test, but am sure it has to do with the armsoc drivers. It seems to affect my system with both the 2015 and 2017 disk images. It's not the system itself, as the console and boot process are fine, as are an android image I tested. Does anyone else have this issue, and how do I fix it? What also I don't understand is how is this not affecting everyone using the image, as it does this to my system with the default settings? Thanks for any light you can shed on the issue. poopins wrote: I used to use this image years ago and remember it being excellent. Recently I've been trying to get this image running and for some reason whenever X starts it is an ungodly mess - it looks like huge slanting diagonal streaks, as if the rendering is trying to rending an image much too large. The U2/U3 officially only supports 720p and 1080p resolution, but thanks to armsoc framebuffer drivers other resolutions are possible as well, but not all will work. So depending on your TV/Monitor the resolution might not be supported. poopins wrote: Weirdly, the mouse cursor is rendered on top of this and works perfectly. I believe this is because Xorg renders the mouse cursor seperately? poopins wrote: Once XBMC starts the mouse cursor disappears (I presume because it starts rendering it with the mali drivers) but the rest of the screen is still rendered in the same broken slanting horizontal fashion. The console works fine an renders normally. Console renders in 720p. The U2/U3 comes with boot.scr files either for 720p or 1080p as 720p is more likely to support older TVs/Monitors it's set to 720p. Console always renders in 720p while Desktop is on a "autodetect" from what your TV reports. poopins wrote: I cant get a working vesa or fbdev xorg config to test, but am sure it has to do with the armsoc drivers. vesa and fbdev are not supported, in fact aside from armsoc nothing will work. poopins wrote: It seems to affect my system with both the 2015 and 2017 disk images. My guess it's an issue with the TV/Monitor and not the board, so the image, either 2015 or 2017, does not matter as the driver did not change since then. I can just say that it works fine on my Samsung TV in 1080p. I also used ODROID VU in 1080p mode which also works fine with the image. poopins wrote: and how do I fix it? Try to quit XBMC and do a system upgrade the system should use Kodi by now and no longer XBMC if it's all up to date. Try open a terminal and type xrandr check the output interesting could be infos like "current" which gives you the current desktop resolution but also it might be interesting what other resolutions are reported that are claimed to be supported. This will switch the desktop resolution to 720p and maybe this is working better for you. Also if you can try a different TV/Monitor. poopins wrote: What also I don't understand is how is this not affecting everyone using the image, as it does this to my system with the default settings? First, the U2/U3 is rarely used anymore, it's no longer produced for several years and people moved on to other systems, so the number of people still using this particular image is getting smaller and smaller. Still that doesn't mean it's no longer working.. I have a U3 running right now using the same image and as I said, it's working perfectly fine on my side. Excellent, that worked perfectly! It was the tv, it was outputting at some 1366 resolution. I ran it on a different tv which put it at 1080, added the xrandr command to the startup section for mate under the settings directory, and now it seems to be working fine. I see in your repository that the latest chromium is 52. One of the sites I visit wants 55 or later. Do you have that somewhere other than in the Chromium directory? Actually the latest chromium from my repository is chromium 57. So I use Recalbox cause I don't like having to use a keyboard and mouse to change settings and what not. I just tried ogst today and already ran into a problem. For some reason I had to go to the desktop to be able to set up my wifi. When I restart the system I have no wifi in Kodi. I have to go back to the desktop to click on the top right to get WiFi back. Also I keep getting a pop up and have to keep putting in the password. What am I doing wrong why don't my wifi stay connected. LeeMcNutt wrote: So I use Recalbox cause I don't like having to use a keyboard and mouse to change settings and what not. I just tried ogst today and already ran into a problem. For some reason I had to go to the desktop to be able to set up my wifi. When I restart the system I have no wifi in Kodi. I have to go back to the desktop to click on the top right to get WiFi back. Also I keep getting a pop up and have to keep putting in the password. What am I doing wrong why don't my wifi stay connected. By default Linux uses a password store (keyring) to store passwords and configurations like SSID and such for WiFi in. This keyring needs to be "unlocked" to use the data inside. Normally this is done on "login" as you enter your username/password this is enough to verify you are you and the keyring is unlocked. Since we use autologin for the desktop you are technically not authorized to use what's stored in the keyring. Therefore it asks for the keyring password when you try to connect to the WiFi and does not automatically connect. Just so you know why this is happening. Use an unencrypted keyring, means all login information for your WLAN is stored unencrypted in plain text, not recommend but doesn't really hurt either. For this go to /home/odroid/.gnome2/keyrings/ and remove the keystore and keyring files in here (delete them or rename them whatever). Restart the ODROID and setup your WiFi again (all settings are gone as we removed the keyring/store). When you configure your settings for WLAN it will ask you to define a keyring password. leave this empty and you have an unencrypted keyring. From now on WiFi will connect automatically as the keyring does not need to be unlocked first. Did someone get kodi-next-odroid (Krypton) get to work with CEC? 13:47:27.899 T:3026309120   DEBUG: LoadMappings - loaded node "CEC Adapter"
13:47:27.899 T:3026309120   DEBUG: LoadMappings - loaded node "Pulse-Eight CEC Adapter"
13:47:27.899 T:3026309120   DEBUG: LoadMappings - loaded node "iMON HID device"
13:47:27.899 T:3026309120   DEBUG: LoadMappings - loaded node "WETEK Play remote"
13:47:27.899 T:3026309120   DEBUG: LoadMappings - loaded node ""
With kodi-odroid (libcec3), CEC works perfectly fine so I can exclude general hardware incompatibilities. But I haven't looked into it in a very long time. maybe I can find a way to rebuild CEC4 for Debian Jessie in a way it works. Let's see what I can find out. well good news and bad news... I got CEC4 working, BUT this results into a broken version of Kodi, as both use different versions of libp8-platform. Which means, in order to get both working, I probably have to completely rebuild Kodi as well. nah that's some other things.. cec is loaded as a module.. but I think I figured it out now. I could compile CEC with the same libp8-platform kodi was compiled against and it seems to work fine. I've uploaded them right now, since the old packages didn't work anyway, there shouldn't be any harm in it. Please let me know if the new packages work for you or not. Using kodi 17.6, I see horizontal tearing, consistently in the lower frame of the picture, in scenes with horizontal panning. I had no tearing whatsoever with kodi 16. Does someone observe the same and/or found a solution to that? I haven't tried Kodi 17.6 on the U3 yet, so I'm not sure if this is a general issue. Sadly I personally find Kodi got worse with each new version. I loved XBMC 13.2 it was stable, did what it was suppose to do and everything was working perfectly fine. After that Kodi got worse and more unstable little by little. Anyway.. I'm not sure if it will help you but you could try pinning refresh rates of videos to 60 Hz. There's an option for that in Setup ODROID GameStationTurbo.. it helped reducing tearing on the XU4 which suffers from terrible tearing issues. I see. I'll try to play around with the refresh rates. I noticed that there is less tearing in videos that play at 24hz. I have set the refresh rate in Mate to "auto", so some videos play at 24, others at 60hz or even 50hz (according to my TV). In the ogst settings, I've unpinned the refresh rate as that seemed to worsen the tearing. Hi meveric, first I want to say a huge thanks for all your work on making this project for the U3. I started out a number of years ago trying to build an arcade suitcase using a C1, and you were very helpful at that time. Since then I upgraded to the U3 and using your OGST, after a bunch of configuring for my keyboard encoder for my joysticks, and switching from pulse audio to get the audio working out the headphone jack instead of hdmi, it's been really stable and working great. Still using the wheezy image. Now, however, there's a couple things I'm wanting to add/fix, and hoping you'd be able to steer me in the right direction. I've designed, 3D printed, and built a spinner for the arcade, using a Leonardo Arduino, so it's recognized as a mouse when plugged in, moving the mouse on the X axis. Once I add a 2nd spinner for 2nd player, it will move it on the Y axis. I'm wanting to use these for games like Tempest and Warlords, however, I'm having issues getting mamelibretro to recognize it as input. I've tried setting the player1_mouse_index="0" or "1" in the retroarch.cfg or mamelibretro.cfg with no effect. When I open the MAME config screen while in game and try changing the analog controls, I'll hit enter to change the dial input, and then turn the spinner, but nothing. Looking into it more, I read a wiki here that talks about mame-lr2003 got support for spinners and mouse-like hardware in 2016. I assumed from that that if I could just upgrade libretro to a newer version, it would support it. I've since cloned the git repository in, but not sure where to put the .so file or where to tell RCB to use that newer emulator than the one configured in your image. Would really appreciate any suggestions or help you can offer. The other issue I'm having is that when running older mame arcade games, like Gauntlet or Star Wars upright, ones that have voice sound effects, the sound is choppy, and almost like slow motion, and seems as if the whole emulation has slowed. I suspect this may be because I switched out of pulseaudio to get the audio to go through the headphone jack. I tried flashing your new Jessie image on a different card to see if that would solve some of the issues, however, I've found that consistently my U3 will suddenly crash, go black screen, and I have to cut power and power it on again to try again. I've tried looking through the logs to try to troubleshoot this, however, I've not even sure I'm looking at the right log files, and wondering if my U3 is just overheating. I'm starting to seriously consider upgrading to an XU3 or XU4 after looking at the image you made for that, and reading of the claims of its performance being so much better, but if possible, I'd love to get this working with my U3, as so far everything else has been working flawlessly. PS - if you're curious about my suitcase arcade build, let me know and I'll post pics. Looking into it more, I read a wiki here that talks about mame-lr2003 got support for spinners and mouse-like hardware in 2016. I assumed from that that if I could just upgrade libretro to a newer version, it would support it. Since you're still using the Wheezy image, I also assume that your libretro core is simply to old to handle the input command. And ever since, there is no longer a "single Mame" core, the notion of "mame-lr2003" means that it's the libretro-mame2003 core that they are talking about, which is different from the mame-libretro core. There are now around 5 or 6 different cores, 2000,2003,2003-plus,2005,2010,2014,2016 and current mame plus a couple in between like mame-2003-midway.. mame-2003 or mame-2003-plus are probably the best candidates to look out for, as other cores are probably much different from what you're using right now. I've since cloned the git repository in, but not sure where to put the .so file or where to tell RCB to use that newer emulator than the one configured in your image. 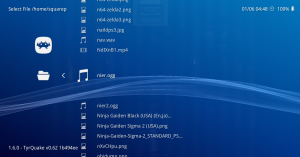 Check under /usr/local/share/retroarch/cores/ there you should find a folder called "good" I believe and in there are the cores used on the image.. you probably find a mame_libretro.so file here which needs to be replaced with the one you build. Make sure you use the 2003 or 2003-plus one, as I believe you won't have much fun with the "mame_libretro.so" form upstream. If you rename the file you build to the same name that you find in the folder mentioned above and copy it in that folder it should already work as it will just assume it's the same file. That is correct, it would have been better to keep puleaudio and set the default output to the headphone. This can be done with a tool called "pavucontrol" which allows you to configure pulseaudio. Here you can select the audio device you want to use for output and could have selected the headphone jack (I do the same with my XU3). Per default I configured retroarch to use OpenAL + Pulseaudio as OpenAL softens issues with sound, instead of choppy audio the game simply runs slightly slower but you don't experience the issues you encounter now. I tried flashing your new Jessie image on a different card to see if that would solve some of the issues, however, I've found that consistently my U3 will suddenly crash, go black screen, and I have to cut power and power it on again to try again. The U3 image is currently in a strange state, as it requires manual steps to update it to the latest version. I haven't had time to update the image yet to give a new out of the box experience. Still I use the Jessie U3 image on my U3 and it's very very very stable.. the system is running for months without issues (no other board is that stable in my opinion). Also with the Jessie image you get MUCH NEWER software and many more emulators. In fact I would suggest using FBA (Final Burn Alpha) instead of directly MAME, as FBA is more stable in my opinion. The XU3/XU4 has much better performance, about 2-3 times as fast as the U3 which comes in handy if you want to play Dreamcast or PSP games, it's also the only board currently capable to work good with 3DO, Sega Saturn, N64, and other hard to emulate systems. but if possible, I'd love to get this working with my U3, as so far everything else has been working flawlessly. For the Wheezy image follow the steps above.. For Debian Jessie we probably have to check what you've done so far.. As I said, there are a lot of manual steps involved at the moment fixing repositories and installing updates and such. Sorry it's taken me long time to try some of those steps before responding. I've been struggling with getting the Jessie image to work, with little success unfortunately. Currently, the system boots, it auto-loads kodi, and instantly goes to black screen, and u3 appears to be off, with just the red power led lit. Pushing and holding the reset button resets the odroid and it attempts again, but no joy. I've once or twice been able to quit kodi right away without it crashing, and interact with the terminal, but it's very inconsistent, and it takes a long time to boot in between. When I was able to get terminal open, I attempted to run apt-get update && apt-get upgrade, however, I think the source links are not updated, as I've read in a different forum that you updated your packages to work better from https, and all the links on update are showing connections to http. I wish there was a way I could prevent kodi from auto-starting and crashing, so I could try and finish updating everything properly, but haven't found any sort of quick key or anything that prevents it from booting. I think at this point, unless you have some other suggestions, I may go back to the Wheezy image I still have on a different sd card and works quite well. Sorry it's taken me long time to try some of those steps before responding. I've been struggling with getting the Jessie image to work, with little success unfortunately. Currently, the system boots, it auto-loads kodi, and instantly goes to black screen, and u3 appears to be off, with just the red power led lit. This sounds like a failing power supply. I attempted to run apt-get update && apt-get upgrade, however, I think the source links are not updated, as I've read in a different forum that you updated your packages to work better from https, and all the links on update are showing connections to http. Ah yes.. the U3... It's been a while. Maybe I can create a new image with fixed sources, since it's been a while and by now there where a lot of changes regarding the URLs. remove it from there and it will no longer autostart. I hope I will find the time to fix this image. As usual, I'm so impressed and appreciate your quick response. That would be amazing if you're able to find the time to update the U3 packages! But also understand that you probably have many other more pressing priorities, as do I, often. Thanks for the the suggestion about a failing power supply. Didn't think of that. I'll try swapping it out and let you know if that makes a difference.